Bottomline: TAG cooling pad is one of the good choices to keep your laptop cool without making too much noise. This looks good and offering connectivity to USB drives as it using one USB to draw the power, so you have all the USB ports available with you. Additional, it has fan speed controller enabling you to decide how much cooling is required. 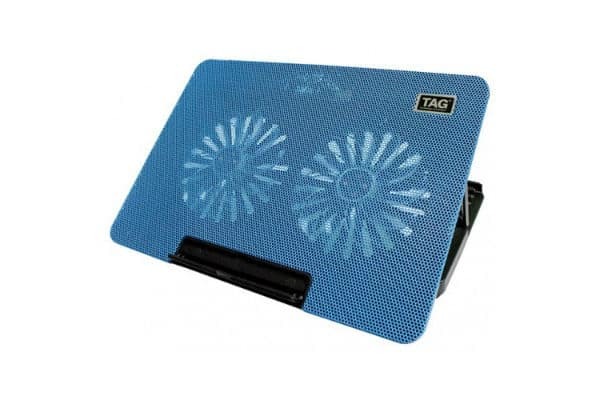 TAG’s new cooling pad- 2000 can support up to 17-inch laptop. This comes with dual 14 cms fans which run using USB power. The cooling pad offers enhanced radiation cooling with the large metal mesh. The silent pad can be adjusted in 6 angles height. This metal stand can be used in various conditions as it comes with Anti-Slip design ensuring the safety of your notebook. It has 2 USB ports on the rear side, one draws the power to the pad for the fans while another one can connect any USB drive to your laptop. There are two more buttons – one to on and off the LED light and another to control fan speed. At the front, it has one notebook stopper to keep the laptop in place while on inclination mode. With the slightly angular top, it offers a good laptop stance when placed on it. The laptop sits well on the surface and diffuses the heat of the laptop as well as refreshingly whips up a coolness beneath. It is a portable and lightweight cooling pad.